Protect your horse from those pesky little annoying insects that aggrivate your horse. Our fly protection products consists of name brands that you have came to trust and know throughout the years. Be sure to check out the selection of fly masks, boots, and fly sheets that we have lined up for you in one place. This category contains all other fly protective items besides fly masks, fly sheets, and fly boots. We have items in here for your horse's belly and body. 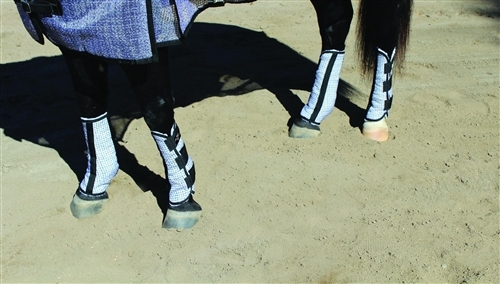 Fly boots help keep your horse from injuring himself/herself due to biting flies. Horses can get very annoyed when flies are biting them. They stomp, kick, and sometimes trot or run to get away from flies. For sensitive skinned horses it is even worse because their legs will bleed from the biting flies which will attract more flies to them. 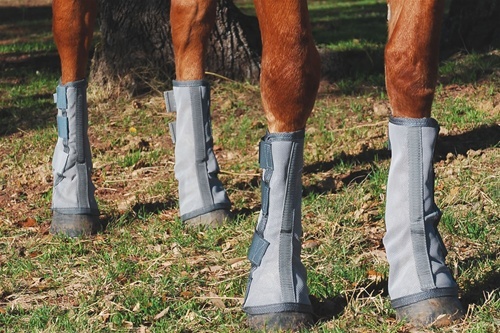 Help protect your horse and keep him/her at peace during the summer months and pick out your fly boots today. Get your horse a fly mask and he/she will thank you for it! We have a variety of styles and brands to choose from. 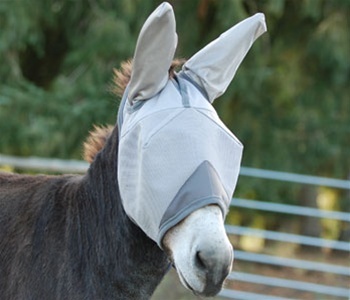 Did you know that fly masks are a great way to protect your horses eyes when you haul them? A fly mask will help keep airborne particles from getting in your horse's eyes while traveling. 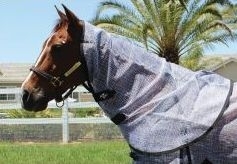 Check out the variety of fly sheets we have to offer. Your horse deserves the best in fly protection and needs a safe alternative to toxic sprays. 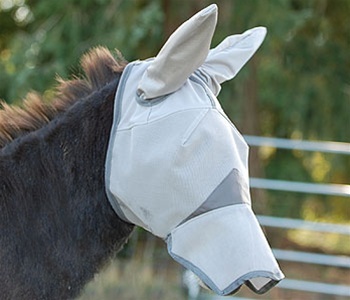 The Crusader Fly Mask has been rated #1 by clinicians and equine publications for comfort, design, and fit. With a form fitting cap made of soft micro mesh and a patented forelock hole that keeps hair out of the horse's eyes and prevents forelock damage, this mask stays put while your horse is stalled or turned out in the pasture. The unique double dart around the eye area will keep mesh away from the temples, eyes, and eyelashes. Soft vinyl coated polyester mesh blocks 70% of the sun's damaging UV rays and protects the sensitive soft tissues of the eyes and forehead. 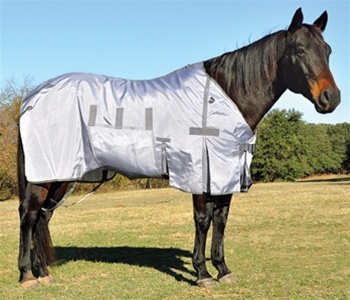 Your horse will appreciate the freedom from flies biting and the comforting fit. 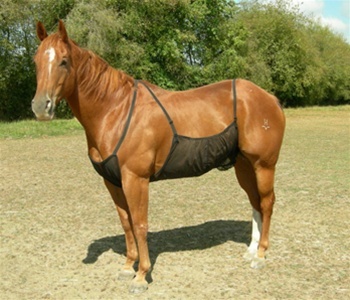 The patented long nose panel protects sensitive white noses from sunburn and biting flies. Grey mesh with grey trim. Care Instructions: Fasten hook and loop straps together. Machine wash, line dry. Choosing a size: Determining the size of your mask is easy. Just match it to your halter size. With the same design and quality as the Cashel Crusader Pasture Fly Mask, the Quiet-Ride Fly Mask will protect your horse while you ride. It is sheer and translucent to give your horse a clear line of vision and not impair his/her sight on the trail. The quiet-Ride can be worn either over or under the bridle and is light weight, comfortable, and nonrestrictive. Be confident your horse is proetected by reducing insect-driven head tossing and giving you a much quieter, safer ride.